The Tri-Cities Early Childhood Development and Middle Childhood Matters Committees continue to collaborate to help move this Children's Charter of Rights forward in our community. Each month we will spotlight community partners making a difference in children's lives by adopting the Tri-Cities Children's Charter of Rights in their regular work. You can also find resources that will help you adopt the Charter of Rights in your personal and work life. Coquitlam Public Library’s mission is to engage its diverse community through creativity, discovery and knowledge. Through its bricks-and-mortar branches – City Centre and Poirier – as well as its mobile Library Link, the library empowers children to learn in a self-directed manner, or to be educated through library programs run by staff and community partners. Opportunities for self-directed learning include reading books, trying educational games on our children’s computers, or joining programs that teach kids about science, computer coding, astronomy, wildlife and the importance of reading, among many other topics. Educational opportunities for youth abound. Children learn vocabulary, movement, fine motor skills and numeracy through recurring programs such as story time, our Reading Buddies program for teenagers and kids, our French club: Parlez-Nous Francais, our Homework Help Club, and our special programs that invite children to learn new technologies. We honour our commitment to STEM programming by teaching youth about Sphero robots, block coding, Raspberry Pi micro-computers, Virtual Reality environments, and more. One of the hallmarks of our public library is its inclusive policies. Everyone is welcome, and has equal access to library spaces, collections and programs. To make children aware that they belong, CPL staff treat inquiries by children with the same seriousness that they would devote to an adult patron. To show them they have a home inside the library, the library creates spaces with children in mind, finding furniture appropriate for their use, shelves that are accessible to young users, and games, decorations and designs appropriate to a variety of age levels. Coquitlam Public Library runs more programs for children than for any other user group, by far. Strategic goals emphasize the importance of offering children’s programs that bring them to the library with their parents or guardians, in order to create memorable experiences for families. Coquitlam Public Library is proud to uphold children’s rights in the Tri-Cities. School District 43 (SD43) is excited to start another year with our students. We had a successful summer running our Summer Learning and Summer Day Camp Program for children and youth. The Ministry of Education recently revised the BC Curriculum in response to the world that students will be entering. The new curriculum was designed to be inclusive, learner-centered and flexible while maintaining a focus on literacy and numeracy and promoting deeper learning through concept-based and competency-driven approaches. At the heart of the revised curriculum are the Core Competencies. These include the intellectual, personal and social skills that all students need in a 21st century world. School Districts quickly realized the traditional Individual Educational Plans were not reflective of these recent curricular changes. SD43 has been part of a Provincial Task Force whose purpose was to develop a new Individual Education Plan that is more aligned with the revised BC Competency-based Curriculum and current inclusive education practices. More than 32 school districts participated in this group which received funding from the BC Ministry of Education as an Inclusive Education initiative. Strength Based Goals –there is a focus on growth – where are you, where are you going and how will you get there? This year our district is piloting the new Competency-Based IEP with a small group of schools and students. Feedback from parents and teachers will assist us with implementing this new IEP district-wide over the next few years. The Tri-Cities Children’s Charter of Rights provides us with impetus to continuously review our practices to make sure that all children are afforded their rights to learn and to have a sense of belonging. These changes to the Individualized Education Plans provide a strong response to the Charter and the ideals that have been laid out by the children of our community. Kateslem is a First Nation word, meaning “coming together.” Kateslem Afterschool Program is a non-profit organization that runs free after school programs in the Tri-Cities. The program welcomes all children and also provides vulnerable youth with a positive, consistent, supportive and safe after school environment. We aim to empower youth through experiences and skill development. We are facilitators in a child’s own growth and tailor our programs to meet individual needs. We help kids develop their leadership skills by having them lead activities once they know how to do it for themselves. Children are exposed to a variety of learning opportunities beyond homework assistance that help them learn, grow and express themselves fully; including public speaking, cooking, internet safety and other life skills. They also have an opportunity to participate in field trips, such as learning dragon boat racing and helping to take care of our very own community gardens at Como Lake Middle School. We will also have more gardens at Birchland Elementary and Glen Elementary soon. Kateslem staff value the Right to Belong and the Right to Learn. Our low youth to staff ratio facilitates trust and understanding between youth and program staff. Kids who participate in our program are in a space where they feel a sense of belonging, are encouraged to express who they really are, are heard and can feel proud. They can leave their issues behind when they come to our program. Here at Kateslem, we strive to teach kids we’re all friends, we can respect one another and we can treat others the way we want to be treated as we learn new things and explore ourselves more. Sometimes, kids who may not have wanted to be at school for whatever reason are excited to come to their Kateslem program. That makes us feel good about what we do to help children feel included and safe. Kateslem operates Monday to Friday, from 3:00 pm to 5:30 pm, during the school terms, with snacks provided each day. Learn more about Kateslem After School Program. The New Beginnings Program offered by SHARE Society provides a safe and supportive environment for Government-Assisted Refugee (GAR) families with children from birth to ages five, who are living in the Tri-Cities. Parents can learn and play with their children, share and develop their parenting skills and knowledge, develop friendships with other parents, and connect with community resources that can support them in their parenting role. The #HiNeighbour program helps kids thrive by providing an avenue that helps them connect with others in their neighbourhood via community projects and gatherings led by volunteers. The program currently serves Coquitlam River and Burke Mountain residents and is part of the United Way Avenues of Change initiative. Coquitlam Centre supports children by co-sponsoring children’s programs, such as Family, Play and Learn events where children complete a variety of learning activities, participate in story time, and receive a free book. They also host the BE YOU! program from September 16 – 23 that aims to increase self-esteem and empower girls aged 9 to 16. Visit your local library to find out more about the programs they offer that celebrate children’s right to learn and help children gain a sense of belonging in their community. Visit Tri-Cities Early Childhood Development Committee’s website to view a calendar of events along with resources and a list of community organizations providing services and programs for you and your kids. Live 5210 Play Box Program provides access to sports equipment for everyone via Play Boxes in Port Moody & Port Coquitlam. Find resources such as the Charter of Rights in Farsi, Chinese and Korean, PDFs to promote the Rights, and external links about child rights. We respect your privacy and will only use your email address to send you Tri-Cities Children’s Charter of Rights in Action newsletters or other Charter news. Thank you! 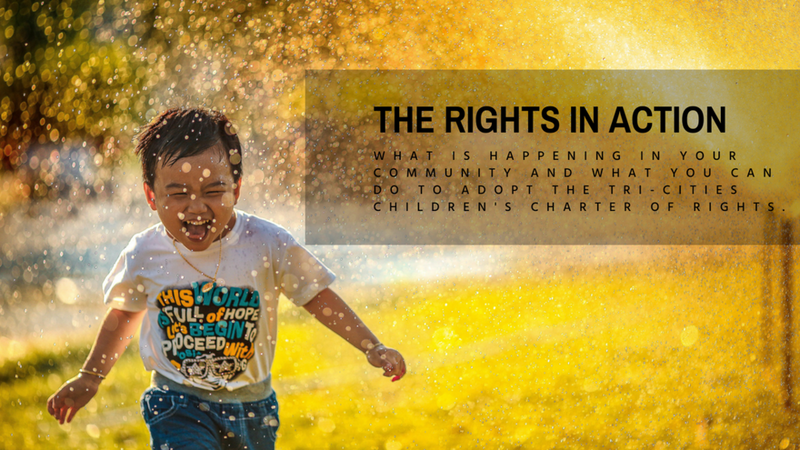 The Tri-Cities Children’s Charter of Rights in Action newsletter is a monthly newsletter. You may receive other news related to the Children’s Charter or the committees that work with the Charter from time to time (Tri-Cities Early Childhood Development & Middle Childhood Matters Committees).